We engage fully in the world by asking questions about it. It’s through questions that we begin to think about issues more deeply and understand problems more completely. Undergraduates’ questions may be powerful scientific questions; important social questions; they may be equally child-like, inspired by sheer wonder, but with a complexity underlying their outward simplicity. Through questions, students embrace a boundless curiosity about the world we live in, our role and responsibility in it, and our journey through it. Throughout their experiences, UW undergraduates have been challenged by a broad set of views and perspectives on a wide range of topics, and they have learned to think critically about them. As thousands of our students graduate, we wanted to share some questions of a few graduating seniors who have lived the breadth and depth of the Husky Experience. Joshua Dawson found his passion for the biological sciences while interning at the Fred Hutchinson Cancer Research Center. 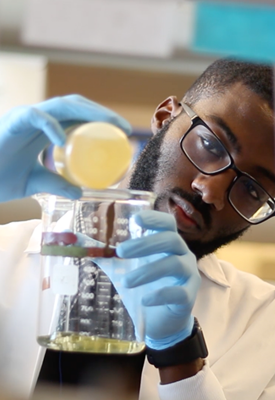 Now a biology major, Dawson is dedicated to creating equity through science and education. To that end, Dawson has served as co-president of the Minority Association of Pre-Health Students, works in multicultural outreach and recruitment with the Office of Minority Affairs and Diversity and frequently returns to his high school to motivate students from underrepresented backgrounds to pursue higher education. He has also been a panelist in public discussions about the need for diversity in higher education at Fred Hutchinson, the Gates Foundation, the Brotherhood Initiative Advisory Committee and the College of Arts and Sciences Advisory Council for Students. Dawson recognizes the importance of learning to lead and has participated in the UW Leaders program, sits on the student advisory committee for the Husky Leadership Initiative, received a scholarship to travel to D.C. for a National Student Government Leadership Conference and is the vice president of the Kappa Lambda chapter of the Phi Beta Sigma fraternity. In the future, Dawson plans to combine his love of connecting people with the sciences and pursue an MD/Ph.D. Dawson is eager to gain as much experience as he can and has participated in the Health Care Alternative Spring Break, the Summer Medical and Dental Education program at UW, and co-founded the King County Shadowing Program. He is an undergraduate researcher in Paul Lampe’s Lab at Fred Hutchinson Cancer Research Center and has presented his research in multiple conferences around the country. Additional accomplishments include recognition as a Gates Millennium Scholar, Costco Diversity Scholar, Washington State Opportunity Scholar and Husky 100 member. Following graduation, he will move to the East Coast to continue his research career at the National Institutes of Health. Diana Gil Vargas’s interest in people and their stories is an integral part of her path to and through the UW. As a student at Yakima Valley College, Gil Vargas became intrigued by the UW after hearing about her younger sister’s Husky experiences. Her determination to transfer to the UW deepened after learning about the community, environment and planning major — a discipline that spans her academic and personal interests. Buoyed by the support for first-generation and transfer students, Gil Vargas worked closely with advisers from Yakima Valley College and UW to ensure a smooth transfer to Seattle. Gil Vargas came to the UW wanting to learn more about the intersectionality of people, place and the environment, and her internships have added another point-of-connection to her coursework. She has held internships with Leadership Without Borders at the UW’s Ethnic Cultural Center, the City of Seattle Office of Sustainability & Environment’s Equity and Environment Initiative, and the Latino Community Fund. Additionally, she has volunteered as a CEP community engagement committee member, CEP outreach and admissions committee member, and Purple Group programming chair. Gil Vargas also earned a Mary Gates Research Scholarship for her self-designed research project analyzing the effects of colorism in the Mexican immigrant community. She presented her research at the 2018 Undergraduate Research Symposium. Gil Vargas will begin her job search after graduating this spring. A dedicated researcher and leader, Diana Park is making the most of her Husky Experience. She spent a quarter at the UW’s Friday Harbor Labs in the San Juan Islands conducting marine biology research. In a campus-based lab, she researches with Dr. Alexis Licht in the UW’s Earth and Space Sciences Department to date the evolution of the Indo-Burman mountain ranges and examine the Indo-China continental collision. She also researches the palmitic acid in ocean sediment and its relationship with bottom water oxygen concentration with Dr. Julian Sachs. This project provided the foundation for her senior thesis and included a three-day research cruise, writing a research proposal and oral presentation. 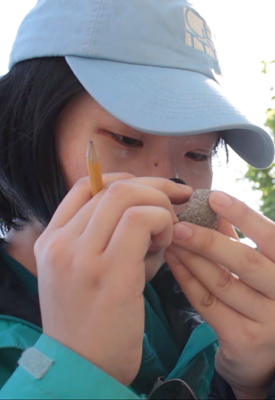 Park has presented her research to a range of audiences, spanning outreach presentations to elementary students to UW students and faculty through the Undergraduate Research Symposium. As a leader, Park serves as president of the Foundation for International Understanding Through Students (FIUTS), the main organization for UW’s international students and, with a 70-year history, one of the oldest such organizations in the U.S. Also for FIUTS, she coordinated the CulturalFest Expo and ran orientation for more than 2,000 new international students. Park’s leadership interests include educational equity, and, to that end, she is active in the UW Dream Project through which she trains college student mentors about social justice and education equity, and organizes college prep activities for students at Renton High School. Park also completed a Husky Leadership Certificate. In the future, she plans to knit together her research and leadership experiences through teaching science at the high school level or above. Natalie Pearlman’s dedication to equitable access in healthcare comes from her experience growing up in rural Northern California. After moving to Seattle to attend the UW, Pearlman volunteered at the UW Medical Center, interned at Seattle Children’s Hospital and participated in two Rural Health Care Alternative Spring Breaks. These experiences revealed to her the deep disparities in access to basic healthcare between urban and rural communities. The insight inspired her career goal: To practice family medicine in a rural setting and be an advocate for health education and community. Pearlman is mindful of the role culture plays in a person’s well-being and health and is working hard to gain as much experience as she can before embarking on her career. Through the Honors Program, Pearlman is taking classes that focus on cultural, global and interdisciplinary perspectives. She spent a summer studying Latin American Feminism and its ties to traditional Andean culture in Quito, Ecuador. Actively involved on campus and the Seattle community, Pearlman is a scientist, leader, educator, mentor and explorer. 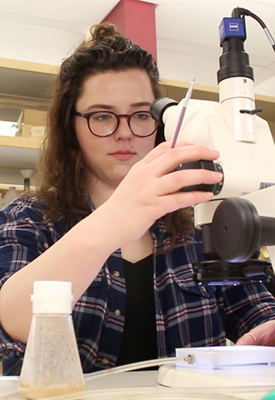 She serves as a peer facilitator for intro- and upper-division biology courses. She is a researcher in Daniel Promislow’s pathology lab studying Alzheimer’s disease. She volunteers as an assistant troop leader for a local Brownie Girl Scout Troop, serves as UW Leaders’ assistant director for the Associated Students of the University of Washington, and earned a Husky Leadership Certificate. Following graduation, Pearlman plans to return to California and work at healthcare clinics and a bakery while preparing to apply for medical school.